The tragedy of Meriam Ibrahim, the 27-year old Sudanese Christian who was convicted of apostasy on May 15, should be familiar by now. On Tuesday, June 9, an appeals court in Khartoum began reconsidering her sentence. The appellate court overturned her conviction on June 23 and released Meriam from prison. Less than 24 hours after her release, Sudanese officials re-arrested Meriam, her husband, and her two children and accused her of travel document forgery and providing false information. After two days of detention at the airport, the family was re-released and is now staying at the U.S. embassy in Khartoum on the condition that she stay in Sudan. Meriam was convicted of apostasy after she married Daniel Wani, a Sudanese Christian man with U.S. citizenship. Even though Meriam’s mother raised her as an Orthodox Christian, her estranged father is Muslim, and, by extension, so is Meriam under Sudanese law. Her self-identification as a Christian led to the apostasy charge. Though Khartoum’s seesawing between arrest and release warrants outrage by itself, Meriam suffered even more severe persecution for her faith. Meriam was eight months pregnant when she was imprisoned and was forced to give birth to her child while shackled in a Sudanese jail. As she recounted in an interview to CNN: “I gave birth chained. Not cuffs but chains on my legs. I couldn’t open my legs so the women had to lift me off the table.” Prior to her acquittal, Meriam faced a punishment of 100 lashes and death by hanging. Sudanese officials also threatened to take custody of both of Meriam’s children. 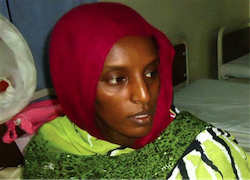 Meriam Ibrahim was re-arrested on forgery charges the day after she was released from imprisonment for apostasy. 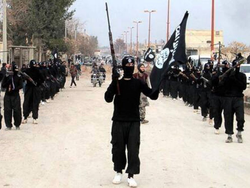 Historically, apostasy was tied to the rebellion against the Islamic state, not merely falling away from the faith. Gradually, however, various Islamic scholars contorted this original understanding and began defining apostasy as renouncing Islam and added the death penalty for unbelief. Today, tragically, there are many people convicted of apostasy around the world whose plight does not receive the attention it deserves and needs. A recent study by the Pew Research Center found that 20 countries in Africa, the Middle East, and Asia-Pacific have laws penalizing apostasy. These laws are often so overly inclusive as to be almost limitless. Governments use apostasy bans as a tool to persecute people for unorthodox religious beliefs and for converting from Islam and to repress Muslim political reformers who challenge the legitimacy of their regimes. Private individuals and groups often mete out punishments that are even more severe than those that are officially sanctioned. Two weeks ago, for example, the New York Times reported that a father from Pakistan fled to Afghanistan to escape his family who threatened to kill him and his three-year-old son for converting to Christianity. Official and extra-judicial apostasy laws clearly violate the fundamental right to choose, and change, one’s religion, and Meriam’s conviction highlights the intolerance, severity, and cruelty of such laws. Despite all of the public support for Meriam, the U.S. State Department only publicly denounced her imprisonment on June 12. Secretary of State John Kerry correctly urged “the Sudanese judiciary and government to respect [Meriam’s] fundamental right to freedom of religion” and “to repeal its laws that are inconsistent with its 2005 Interim Constitution, the Universal Declaration of Human Rights, and the International Covenant on Civil and Political Rights.” Prior to this statement, however, the State Department had only stated that it was “deeply disturbed” by the sentence and apparently would not recognize the couple’s children as U.S. citizens without DNA testing even though Daniel holds U.S. citizenship. There are also reports that the State Department “discouraged congressional leaders from speaking out publicly on behalf of” Meriam and her family. Rather than retreat from such blatant affronts to the fundamentally and eternally important right of religious freedom, the United States, and American citizens, churches, synagogues, and mosques, should work feverishly and publicly to renounce apostasy laws and to obtain the release of those imprisoned for their faith. The United States should not withhold good from those who deserve it, especially when it has the power to declare and to show that those convicted of apostasy will not suffer alone. Bryan Neihart recently graduated from the University of Denver with a J.D. and a master’s degree in international human rights.